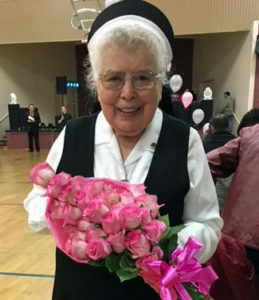 Sister Silvia Troncoso (Sister Maria Silvia de Jesus) came to Washington State’s Yakima Valley from Bernarda Morin Province in Chile in 1992 as a missionary. Today she is 86 years old and has been a Sister of Providence for 68 years, the last 26 of them in Yakima. That chapter of her story began in 1992, when Diocese of Yakima Bishop Francis E. George, OMI, asked the council of Bernarda Morin Province to send sisters to minister to the burgeoning Hispanic population there. The province leadership missioned Sister Silvia, who brought to her new role as a missionary a background in education, catechetical work and leadership development, as well as optimism, joy and a zest for life. Sister Silvia arrived in the former Sacred Heart Province in Seattle and began living at St. Joseph Residence as she prepared for her new ministry by enrolling in intensive English classes at Seattle University. Bishop George wrote the fathers, deacons and sisters of the diocese to let them know Sister Silvia was preparing to come and work out of St. Joseph Parish in Yakima and St. Peter Claver Parish in Wapato. The thrust of her ministry was two-fold: home visits with Hispanic families and religious formation of parents preparing their children for reception of the sacraments. She would live with sisters from her religious community and was expecting to stay for three years. Sister Silvia has been a force in motion ever since, working in evangelization and catechesis of adults, adolescents and youth. She began ministering to the Hispanic population at St. Joseph Church in Yakima and St. Aloysius Church in Wapato through the catechesis and evangelization programs. For the first year she worked for the Diocese of Yakima, but when economic conditions in the parish no longer made that possible, the Sisters of Providence sponsored her ministry. For 26 years she has touched countless individuals, thousands through her classes to prepare for Baptism, First Communion and Confirmation; her counseling of couples preparing for marriage; her insights shared with 15-year-old girls readying for their traditional Hispanic “coming of age” celebration, Quinceanera; her fundraisers and events like the annual Valentine’s couples dinner and dance she initiated; and thousands from all over who have returned to Yakima each year for the Congresso, a three-day Hispanic charismatic conference that fills Yakima’s Sun Dome the weekend following Easter. She initiated and led the Congresso until it became an independent non-profit corporation, supporting it by collecting donations and selling food, books, tapes and religious articles. Her efforts were so successful that each year’s collections for the free event brought in money to pay the bills, to donate to the parish, make a down payment for the facility for the next year, and put money in the bank. That’s just touches the surface of her reach and influence. Sister Silvia has delighted countless people with her amazing culinary skills, turning out mouthwatering dinner rolls, Chilean treats like flan, empanadas and Afajol (candy) to gourmet meals for celebrations. In addition to cooking, she has shared with members of Grupo Emilie, a group of women ages 16 to 35 to further evangelize and to foster vocations, her love of sewing, knitting and gardening. And she has been the embodiment of Providence for the area’s Spanish-speaking Providence Associates and a tireless community volunteer. In September 2007, Sister Silvia made a perfect score on her oral exam for citizenship and was sworn is a U.S. citizen on September 28, while still retaining Chilean citizenship. Sister Silvia truly has been blessed and has blessed others in her time in the Yakima Valley as “one sister who would do the work of three. Most of all, Sister Silvia has been a friend – to the Sisters of Providence who have lived and ministered with her through the years, to the Hispanic Providence Associates who have come to know the mission of Providence through her, and to the people for whom she has been a friend, a confidant and champion as they struggle through issues of poverty, family life, immigration and deportation fears, illness and death. She never took a day off and grateful people with little else brought fruit for canning and making jam as a thank you. She returned to Chile in February, after celebration and thank you events in Yakima and Seattle. “We are most grateful for the 26 years, 1992 – 2017, that Sister Silvia has spent living and ministering in this province. She truly has been the presence of Providence for hundreds of people. With love and gratitude we say goodbye to her after these many years as a missionary in the United States.” – Provincial Superior Judith Desmarais.